Prepare to be spooked: Mr. Bones was found on a ship buried at the bottom of the sea many years ago. It’s not Halloween yet, but scientists have made a super spooky discovery at the bottom of the sea on an ancient shipwreck: a preserved skeleton. 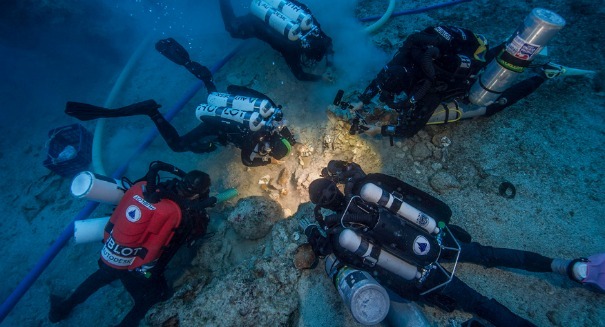 An international research team discovered the skeleton during the excavation of the Antikythera Shipwreck, which dates back to 65 B.C. The shipwreck is located off the Mediterranean island of Antikythera in Greece. The skeleton is believed to have belong to a man in his early 20s, and it was found in about 165 feet of water. It could hold vital clues to what caused this ship to sink 2,000 years ago, according to a Woods Hole Oceanographic Institution statement. So far, scientists have found a partial skull including a jaw and three teeth, as well as two arm bones, some rib fragments and two femurs. They were found on Aug. 31 on the second expedition of the season. Earlier, archaeologists had uncovered a bronze spear, gold jewelry and some glassware.